: ATTENTION : We Do Not Recommend and Strongly Object Against Working A Puppy Or Semi-Adult Dog In Agility Jumping Types Of Activities, Until After There O.F.A. Hip Certification Has Been Done [ At The Age Of 2 Years]. This Applies To Any Size And Or Breed Of Dog. 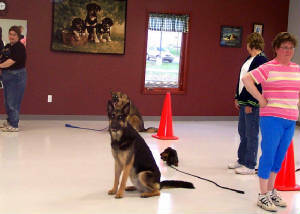 Click on this website link for Obedience Training for IL. & MI. Owned by Sonya Ulrich WWW.SONYASDOGS.COM or call 630-408-6837 Sonya offers Private Classes and Group Classes.Very nice Training fascility layout and there home is on the same acreage.Sonya has just aquired a puppy boy from us to be raised as an in home companion for there little son and as A Trained Pro-Demo Dog.Please check back to watch for Sonya & [ Sheps ] achievements on our site when he gets a little older.I'm sure we'll be recieving some great family and working photos. 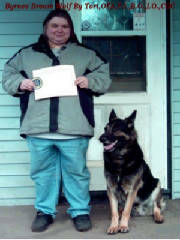 Dec.-2005 Mrs. Roxann Byrne &Trae CGC Cert. Meet Mrs. Roxann Byrne and her Best Friend and Constant Companion/Working Dog.Byrnes Dream Wolf By Tori,Cerf-N,OFA,P.I.,B.O.,I.O.,CGC. [ Recieved his CGC -Dec.-2005 at Valpo Kennel Club] A Huge Congratulations to Roxanne for understanding & appreciating the fine qualities that this boy has and allowing him to excel as a total German Shepherd Dog.Trae is Sired By our Tori's Duke Vom Eskenbach,OFA,DNA,P.I.,P.P.Cert. / Dam - Ro-Lynn Hills Strutter,OFA,P.I. 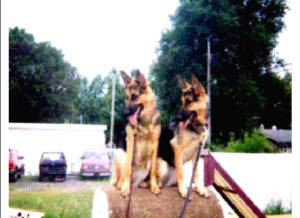 Tori's Tobias,OFA,DNA,P.I.,P.P.Cert./Tori's Shotzie Von Eskenbach,OFA,P.I.,P.P.Cert. Tori's Harley Das Beshutzer,OFA,CD,CGC,TD was adopted as a 6 week old puppy for Pet/Protection by a woman named Cherly Lyons who is now a Co-Trainer for The Train Station Studio,which is owned By Master Trainer Cathy Price. Harley is one of The Obedience Demonstration Staff there as well. Harley is 1 of many successful working in real life dogs out of 6 generations of Tori German Shepherds Breeding Program [ on both parents sides.Harley is Sired By Tori's Tobias,OFA,DNA,P.I., I.S.P. Working Dog Officer X Tori's Shotzie Vom Eskenbach,OFA,P.I. [ The Train Station Studio Is In Valpo Indiana ] They Do Group Training Classes, Private Classes , Puppy Socialization Classes, Behavioral Correction. Byrnes Dream Wolf By Tori,OFA,DNA,Cerf-Clear,P.I. & Tori's Anka V Tannenbruch,OFA,P.I. Sassy and Lucy have there Beginner Obedience,Intermediate ,Advanced,Agility,SAR Appropriate and are now Working Protection.They work seperate or as a team.Owners worked with Mr. Marsh.Owner And Master Trainer Of Great Lakes Canine Training.They are just about 1 1/2 years old at the time and are littermates.The girls are Sired by Byrnes Dream Wolf Of Tori,OFA,PI,CGC-2005, Cerf-N / Tori's Anka Vom Tannenbruch,OFA,P.I.Both Of these parent dogs are from our personal breeding program.